The installation of the module is very easy and our documentation explains all the steps. In the admin product view you can see at a glance all important details such as traffic usage of all assigned ports and the current power status. You can also perform important actions such as adjusting the NOC-PS description or open IPMI / KVM. If you are running IPMI and KVM behind private IPs, customers can access it normally only through a VPN or similar. With the proxy feature, your staff and customers can access IPMI and KVM over the public Internet – directly from the client area or admin area – even though the services are located on the private network. The best part: The security benefits of private IPs persist. Give your customers full control over their Servers! No support requests anymore about server reinstallations. 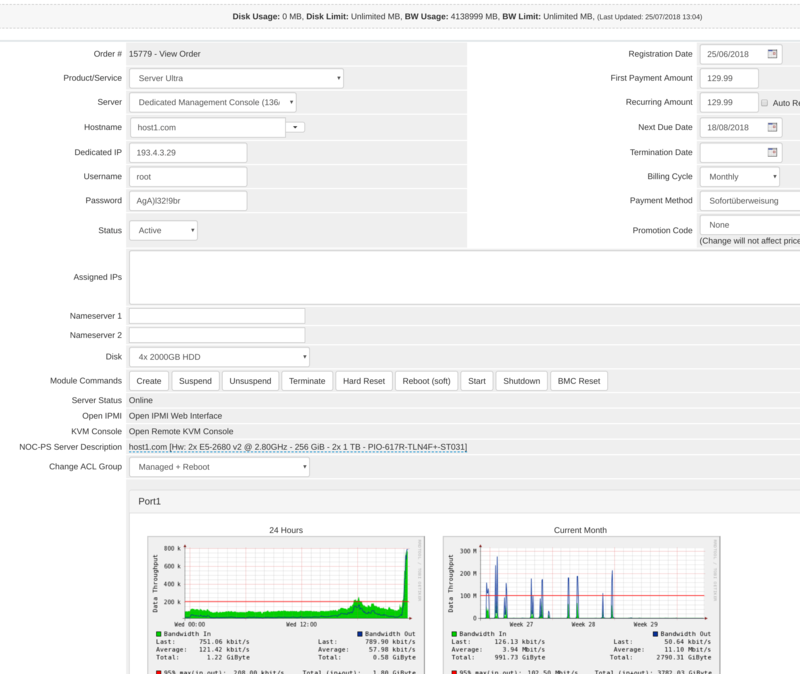 The NOC-PS packages and addons are fully supported and can be activated / deactivated depending on the assigned ACL group. Also Power control is integrated at the client area, combined with useful network and sensor graphs. 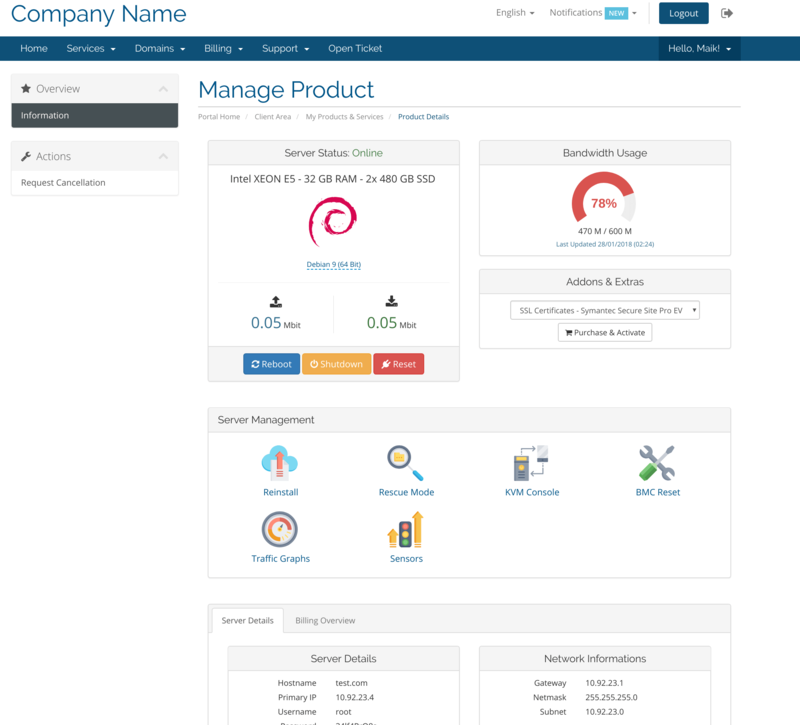 Let your customers manage their servers with ease. 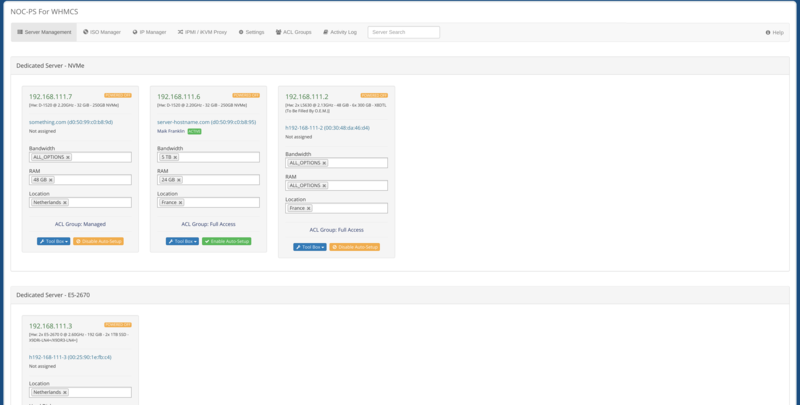 In the admin area, you also have immediate overview of the assigned server and IP addresses. Furthermore, the servers can be managed out of the admin panel. The variety of settings help you to the software behave exactly how you want it. Exclude operating systems from the client panel, setup admin notifications, ISO file management and much more is available.